Not taking it personally when you’re playing in front of people who could care less about what you’re doing isn’t possible for most musicians to do. After all, you’ve spent countless hours and a massive financial investment to get to the point where you’re playing shows, and it can feel like a slap in the face when a crowd isn’t respectful of your art and sacrifice. But rather than letting it get to you, it’s a much better option to play the best that you possibly can despite the lack of energy you’re getting from the crowd. In a way, playing angrily, badly, or insecurely just proves to the crowd that they’re right about you. So give every crowd your best––even if they don’t deserve it. It can be easy to make sweeping judgements about your audience from getting a tepid response after playing a few songs, but that tendency could end up hurting you in the end. 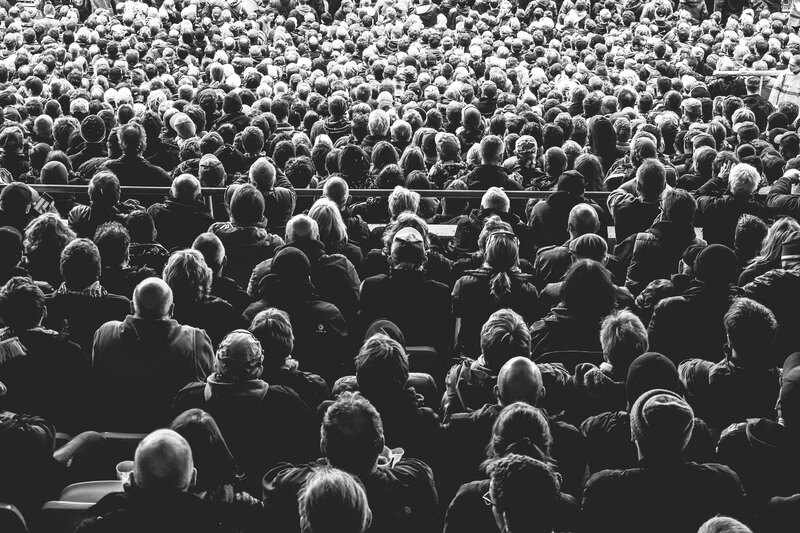 While you might think you’ve got a crowd figured out by the energy and volume of its response to your songs, the truth is that you really have no idea. Sometimes it’s awkward for listeners at performances to show they’re getting into it because they think it makes them feel vulnerable. More often than not, people like this save their enthusiasm for after the show at the merch booth. Or it’s completely possible that your intuition is right and the crowd didn’t like your band. But rather than figuring out all this on stage mid-performance, play your best, let the cards fall where they may. and assess after you’re done. Something very hard but absolutely necessary for performers is to make good use of the positive energy a crowd gives you while deflecting any bad vibes while playing. This is an art in itself, and it involves understanding and interpreting your audience’s energy up until the point that it’s bad for your performance. If you can tell a crowd just isn’t into it, that insight is important, but you’ll need to learn to ignore until you’re done playing. When a crowd just isn’t giving you anything back, it means that you have to double down to make up for the deficit. Not at all easy to do, but nothing in music really is. Patrick McGuire is a musician, writer, and educator currently residing in the great city of Philadelphia. He creates music under the name Straight White Teeth, and has a great affinity for dogs and putting his hands in his pockets. One good reason to always put your best foot forward, and not take it as a personal insult when people appear to not respond, is reading an audience is extremely difficult. I play a regular gig at a nearby restaurant, about every eight weeks, and it always feels like no one is paying attention; yet at the end of the evening, or as some folks are finished with their meal and headed for the door, they give a thumbs up or look for a tip jar for their money. Plus, every gig is like a calling card. If a friend of an audience member is looking for someone for an event, you’d be surprised how often the name of a “professional” performer will come up, and I mean “professional” in the way you present yourself! In an experience like this I just concentrate on performing my best and then check in with the audience and talk to them. Tell them a funny story…”on the way here” ….. and I agree with the statement that sometimes you won’t know until the end of the show that some, maybe not all, will tell you they enjoyed your performance even if your music isn’t their favourite. I played a solo gig a few weeks ago. It was only my second solo gig ever. It was a fair good size audience at a seafood restaurant. I was fairly nervous (even though i have played 100s of times with a full band. The first thing that I noticed, the average age of the crowd was well I’ve 65 years old (I am 59). I was getting absolutely no response for the first 45 minutes. But I was seeing some smiles. After a while, I was see a few people drop some tips in my jar. A little later, some of my friends arrived. They gave me some applause and that is when I was noticing applause from the other patrons. More tips flowed in. At the end of the evening, I counted $143 in tips – WOW! I am playing again two days from now and again at the end of the month. 1) My nervousness was showing. 2) My material was fairly unfamiliar with that age group. 3) They liked me, but we’re shy about showing it. They were not exact sure if they should applause. 4) I was told to be sure I was not loud. I over compensated to where many folks couldn’t hardly hear me. 5) I needed more rehearsal so that I could be more relaxed. 6) I truly didn’t know what the crowd was thinking. Based on the tips, many thought I was doing a good job. I am excited about my next gig, because I have added a lot more classic material and already know what to expect. I book gigs at local bars and breweries, knowing that the people didn’t come there to hear my music, they came to talk to their friends. So my goal is just to get one person to stop talking, turn his head away from his friend, and look at me and listen. That’s very satisfying. Some people might call that low expectations. I call it winning fans one person at a time. And I second what Melissa said– after a set when I thought nobody was listening, I’ve had people come up to me and say, “good songs.” So you never know. I don’t see the point of mostly booking the bring-your-own-crowd venues. You can only drag your 3 or 4 friends around to hear you so many times. I’d rather book places where I can reach new people, even if I only reach 1 or 2 of them. It should never be taken personally. Some people just want to listen and enjoy themselves. They may not know you, but if you leave an impression, your tip jar will reflect it. Just don’t walk in with any expectations and you’re good. Smile and make eye contact with people. Know more than one genre of music so you can accommodate a wider audience. It’s always the personal time after you play that the compliments will flow. Great Article and Great Comments. I always find myself starting off with a song that hopefully the crowd will know… But at the same time I have a lot of songs that the crowd doesn’t know, and the challenge of trying to connect to the audience with a song they can relate to is always satisfying.. As long as you know your material, get into your performance and show the audience your into it, and maybe connect a few audience members that’s what it’s all about… Good luck to all the artists! I totally agree with this article. I play in many places and each crowd is different. I play at a restaurant on a river/boat dock and usually musicians are just fixtures or just part of the atmosphere and nobody is there for you…I use this gig to work out new songs and try songs I have never played. Works out great. Use your time on stage for the ultimate benefit for you and your audience. that is advice I dole out, too. Check your ego at the door. This phenomenon has only increased since most clubs don’t even charge a cover. A paying audience is typically more responsive as they expect something from their cover charge and are more likely to at least listen. Good advice, ReverbNation! Over the past 4 decades you can be sure I’ve been in this situation a few times, maybe more than a few. I scan the audience and look for someone showing any sign that they’re enjoying my performance. As I find them, I make eye contact and give them a little nod or even a wink. As I go through the rest of the show, I make sure to rest my eyes on each of the people I’ve already acknowledged and pick out a few more. Those are the people I’m playing for. As long as I’m reaching one person, I’m successful. Sometimes it can be liberating. The music/performance is less inside your head because you desire the attention. The result is projecting more, exposes yourself. It helps overcome the “don’t make a mistake , play it safe” feeling by going for it , taking risks you mightn’t have otherwise. I think it was Pete Seeger who told the story of his playing for an audience of union workers, such as mechanics or auto workers or the like. They never applauded. But when it was all over, he could tell that they really appreciated his performing for them. So I think sometimes the audience feels constrained by what they imagine their role in the situation is–to give constant feedback (rock bands), to ignore (typical bars), to watch silently (as in classical music)–and maybe the audience doesn’t know what they are supposed to be doing (playing during a church service, or for a union organizing rally or perhaps playing for school children under strict discipline of teachers). My point is that, for me, I have to keep the locus of control of “my” performance inside myself, and believe by faith that it’s good for the audience (all things being equal). And as a general rule, I bring my A-game to small and great alike, as a matter of artistic self-respect. The thing to remember when playing restaurants cafes et cetera is that people have gone in to have a meal and a chat. Your music is something to give atmosphere, it is not the same as a concert so you should not necessarily be looking for applause. That does not mean they have not enjoyed it. If your performance is half-hearted then you are in the wrong job.Always play to your best whether the audience is 10 number or thousand plus. It’s good to have something familiar to give them as well as your own material. Tell them about your song. If you love what you do it will shine through your performance. I have a theory about this that contrasts how performers think vs. listeners think about what they hear. Yes, we all are listeners but at one point, we performers were so inspired by what we felt when we listened, we decided to devote part or all of our lives to learning how to perform. Think about how powerful that is . . . we as performers think of the music that inspires us as this sacred thing. While most people enjoy music, many aren’t moved as deeply as we are, or maybe they are but it manifests itself differently. There are music devotees that don’t perform but performers all share whatever it is that made us decide to perform. I think when we perform we often expect the crowd to be as wrapped as we are (and were) when we listen to what we love and that is a great goal but the truth is, not everyone thinks the same way as we do. This, to me, is the biggest reason why we should avoid taking an unresponsive crowd personally. Okay, we all want to play well and have our music appreciated – that’s a given. But sometimes it’s useful to think about why you were hired for a gig. For example, in a bar maybe all they want is pleasant background music because they know their patrons want to drink and talk (and maybe loudly). In other words, it’s not a concert event where people have come to hear good music. Thinking about that helps set your expectations of what kind of response you will likely get – maybe 2 or 3 people actively listening is a big win in that environment (although it probably won’t feel that way). If what you’re secretly hoping for is that the gig will turn into a concert for you then prepare to be disappointed. That’s why I also do as many open mics as I can. Sure, they’re not paid but I like to “entertain” not just play and because the folks there – often musicians themselves – have come 100% for the music and the feedback is honest. It helps! When I gig at restaurants and bars I try to remind myself that I’m “background music” and that people are there to talk to each other and enjoy the food. There have been times when I saw that the age group of the crowd was young and I worried about my set list of songs so I wasted time between songs flipping through my books trying to find covers to the newest releases to please them. Big mistake. Now I just play my songs as planned trying to do a mix of oldies and newer. Some times people will applaud, say nice things and tip while others will totally ignore me. That’s just the way it goes. It’s easier to not let this bother me when I play in a group rather than soloing. I wrestle with the unresponsive crowd thing. The above comments are helpful, but I still can’t help but feel a tinge demoralised when I feel a song or a set isn’t well received. Yet, I still keep on playing–so the only logical explanation I can think of is that I enjoy inflicting pain upon myself.